Stepping out of a steamy, warm shower onto chilly tile floors is a harsh way to kick off your morning. That's why the bathroom is the most popular room for installing in-floor heating. However, lifting the covers and taking that first step out of bed can be just as harsh. Whether you have engineered hardwood or carpeting in your bedroom, there's only one way to make sure you "wake up on the right side of the bed" every morning — install underfloor heating! WarmlyYours was the first floor heating manufacturer to introduce an advanced design and heating technology to the U.S. market with its Environ™ brand, a non-adhesive foil electric underfloor heating system. Applicable for use under carpet (in the U.S. only), laminate and floating wood floors, the Environ™ floor-warming system is also an affordable solution for those looking to add some warmth to their morning and nighttime routines. Imagine falling asleep and waking up surrounded by pure warmth without any of the dryness or uneven heating that alternative systems, like forced air, provide. And now, imagine that this bedroom renovation won't cost you an arm and a leg. In this instance (see floor plan), the homeowner installed an Environ™ Flex Roll in a large 232-square-foot bedroom and closet*. The closet alone is more than 70 square feet inside! Therefore, two Flex Rolls were needed to fill the space to provide maximum coverage. The first roll is 1.5 by 45 feet. It is cut and turned to fill all of the space in the room but the bed. 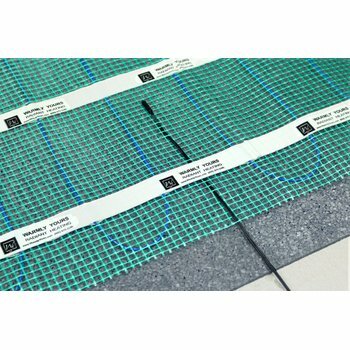 WarmlyYours does not suggest installing in-floor heating under permanent fixtures like beds so as to avoid trapped heat. The second roll is 1.5 by 25 feet and is cut and turned to fill the closet space. With floor heating installed in the bathroom as well, these systems ensure that the entire morning — from waking up, to showering and getting ready, to getting dressed — is filled with comfort and warmth. Best of all, the cost of the rolls for this bedroom cost less than $1,000! Together, the rolls cost exactly $964. That equates to just more than $9 per square foot! Even though two rolls are being used in this room, only one thermostat is required. Once you add a SmartStat™ thermostat to the order, the system costs $1,133. And when you factor in how much it costs to operate the system, the affordability really becomes clear. 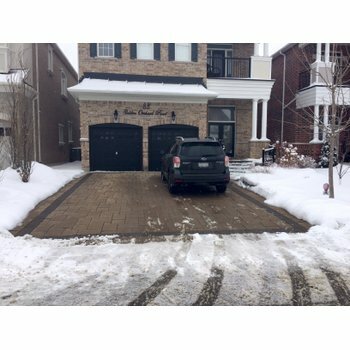 To heat this bedroom for eight hours a day at an average cost of 10 cents per kWh, it costs 44 cents a day, according to WarmlyYours' Energy Use Calculator. That's pocket change! And you don't need to heat the room during the day when you are away, so you can program the system to operate only in the morning and evening when you need it, saving even more energy and keeping your operating costs lower. 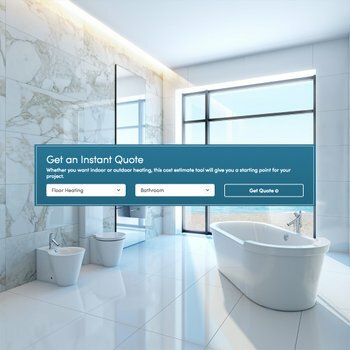 If you're interested in adding radiant heated floors to your bedroom — or any other room in your home — get started with a free instant quote online. 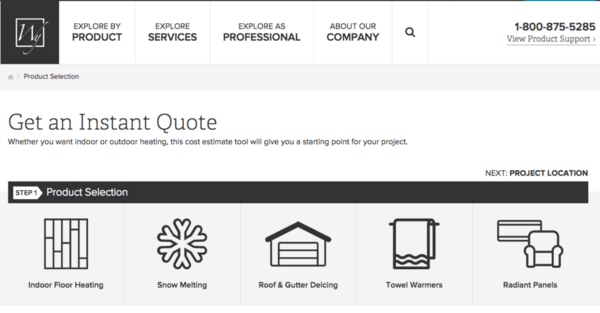 By using our Instant Quote tool, the WarmlyYours team can tell you exactly what you need and how much it will cost. Plus, our tool gives you the option to upload a drawing or image of your floor plan. If you use this option, WarmlyYours will provide you with a customized installation plan with a quote the next business day. Soon enough, you'll know exactly how much it will cost to add the luxury of heated floors to your room. *Please note, the National Electric Code prohibits floor heating in closets. However, it can be installed in closets if the local code authority approves it.